Patients present to our office all the time with symptoms of a painful neuroma on the bottom of the foot. A neuroma is simply an enlargement of one of the nerves on the bottom of the foot. The pain occurs at the base of the toes right before the nerve bisects and supplies the feeling to the bottom of our toes. Most patients describe a feeling like walking on a rock or balled up sock in the shoes. They can also have sharp pains, numbness, or tingling that spreads to the toes. While neuromas can happen to anyone, they are more common in women because of the shoes they wear. Shoes like thin, un-supportive flats and high heels allow an increased amount of pressure to the nerves at the pads of the foot. Most patients with neuromas will have their pain resolved after a short period of wearing proper shoes and an insert that has a pad to reduce pressure to the affected nerve. If the nerve is significantly painful, a steroid injection can be performed that takes only a few seconds to administer. This injection is given from the top of the foot, therefore, avoiding the sensitive skin on the bottom of the foot. Pain relief after an injection usually begins a few days after the injection is administered. For patients that find relief with padding, a custom orthotic can be made for the activity that causes the pain. If athletic activity causes pain, a special orthotic can be fabricated for that shoe. For patients that are required to wear dress shoes or heels, a dress orthotic can also be fabricated. Unfortunately, not all neuromas improve with conservative care, and surgery may be required to alleviate pain. Surgery takes about 10 minutes to perform, usually in a surgery center and patients are allowed to return home shortly after the procedure is completed. Most surgical neuroma excisions are performed with an incision on the top of the foot. After surgery about 25% of each toe adjacent to the surgery site will be numb. This technique allows the patient to bear weight on the surgical foot immediately after surgery while wearing a special shoe and crutches to reduce pressure to foot. 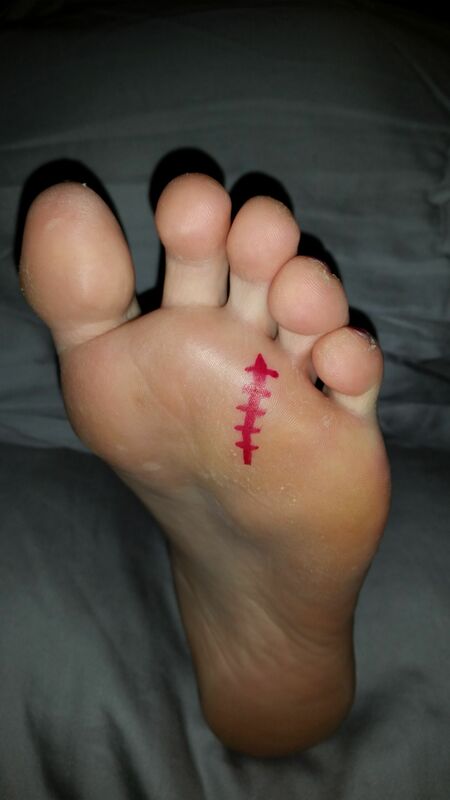 While this incision allows immediate weight bearing, most surgeons will ask their patients to not bear weight on foot for about a week so that the foot does not swell and pain is controlled. There are circumstances where an incision to the top of the foot is not desired. Some patients have had a previous surgery near the incision on the top of the foot. Placing an incision on the top of the foot could affect skin healing if close to another healed incision. Also, patients who have a history of developing a painful localized blood clot, called a hematoma, after a previous foot surgery could develop another one after a neuroma surgery. Patients who have had a recurrence of a neuroma after previous surgery fare better with an incision on the bottom of the foot. An incision on the bottom of the foot, called a plantar approach, is different from a traditional neuroma excision in that the patient cannot apply pressure to surgical site for an additional week. The nerve is more easily visualized by surgeon during procedure, ensuring complete resection. Patients will have sutures removed at the second or third week appointment and slowly return to first an athletic shoe, then regular shoes at about 6-8 weeks. Some patients are not good candidates for the plantar procedure. Patients with a history of thick scar formation, also known as keloids, should not have this approach as scar can become large and be painful when walking. Patients who have poor padding on the bottom of the foot should also avoid this approach. However, this approach is great alternative to many patients who want reduced complication risk or would like to avoid a surgery that creates a visible scar. Request an appointment if you think you may be suffering from a neuroma! We would be happy to discuss your options!